CO2 Gas Type Fire Extinguisher, offered by us, uses quick and efficient flame knockdown property of CO2 gas which makes the device ideal for fighting against intense fires. CO2 Gas Type Fire Extinguisher, provided by us, works effectively for fires which involve flammable liquid for instance oil, paints, varnish, solvents and even industrial gases. The inert CO2 gas present inside CO2 Gas Type Fire Extinguisher, we offer, rapidly prevents the fires by diffusing the oxygen and extinguishes water by squeezing the lever. 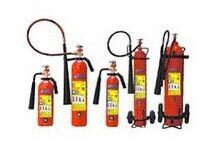 CO2 Gas Type Fire Extinguisher that we provide leaves no residue, hence it is suitable and safe to keep in contact with sensitive electrical equipment.